BEDROOM DESIGN IDEAS – Find your favorite bedroom photos here. 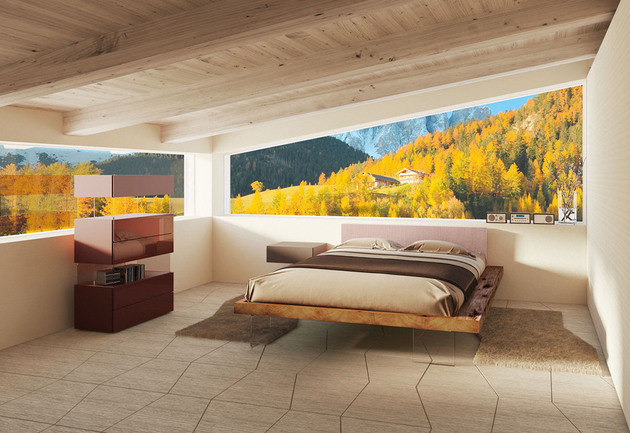 Browse through images of inspiring bedroom design ideas to create your perfect home. All the bedroom design ideas you’ll ever need. 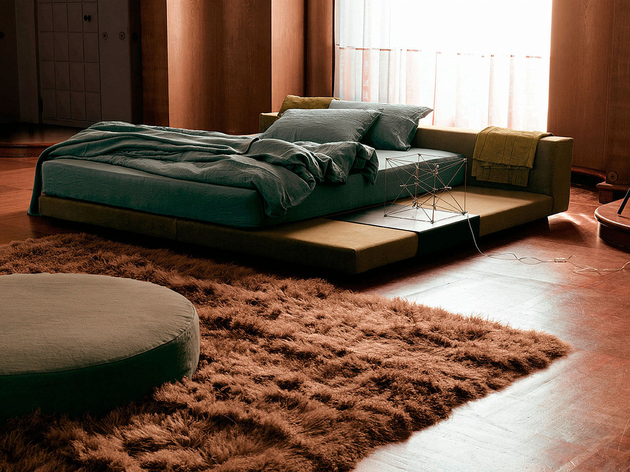 Find your style and create your dream bedroom scheme no matter what your budget, style or room size. 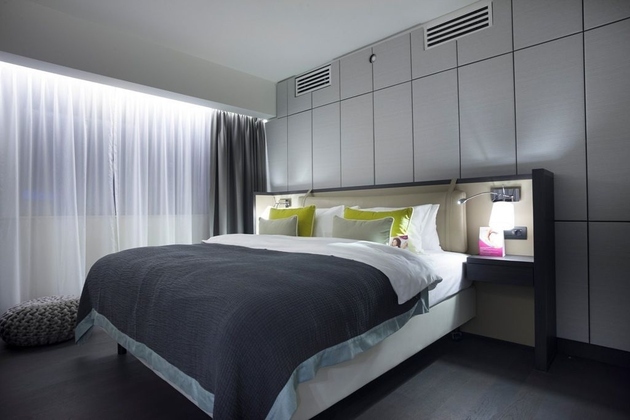 The best way to create a minimalist modern look is to choose a few key items that are stand alone designs like the Him Chair in orange, the checkerboard carpets and the purple bed frame. 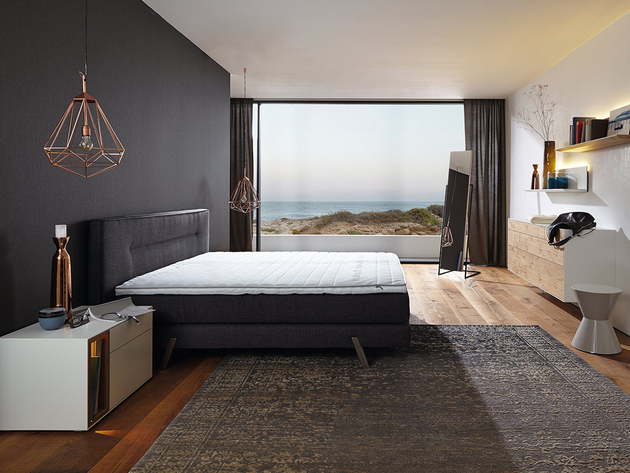 Shape can speak volumes in a minimalist modern bedroom as seen in the above photo with the bedframe designed to “rest” on the continuous night stand support. The above bedroom design keeps the furnishings minimal and clean lined but layers in several artistic moments to really personalize the space. The above design is noisy, but not in an acoustical way, it is filled with the sounds of color and pattern, each carrying a tune of fun, fierce excitement. My favorite pattern is the repeating triangular mill-work on either side of the bed, What’s your favorite pattern? Lucite legs give this modern bed the appearance of floating and the same magical aesthetic has been incorporated into the media cabinet next to it. If you live in a noisy city or just have a hard time tuning out sounds at night, the above bedroom, with its padded headboard and sideboard walls can help acoustically dampen the sounds coming into – or going out of – your room. Once upon a time we all where told that green and blue didn’t work together, thank goodness in today’s modern homes that is no longer the case. 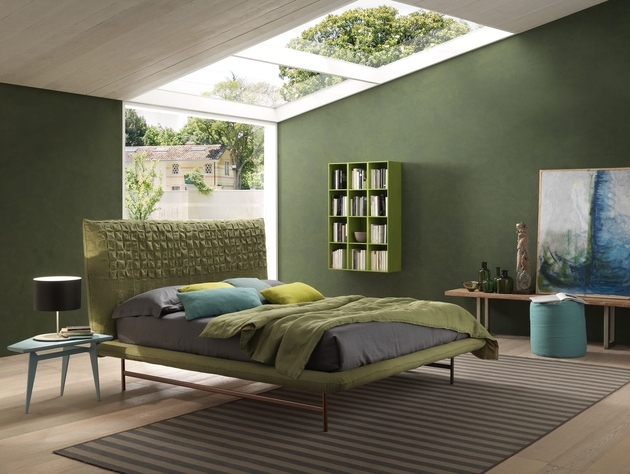 A bedroom filled with both blue and green is such a comforting, nature inspired aesthetic that sleep is just a pair of closed eyes away. While reds bring a blast of heat to a design, blues do the opposite and cool a space down, making a blue bedroom a perfect place to be on a hot summer’s eve. 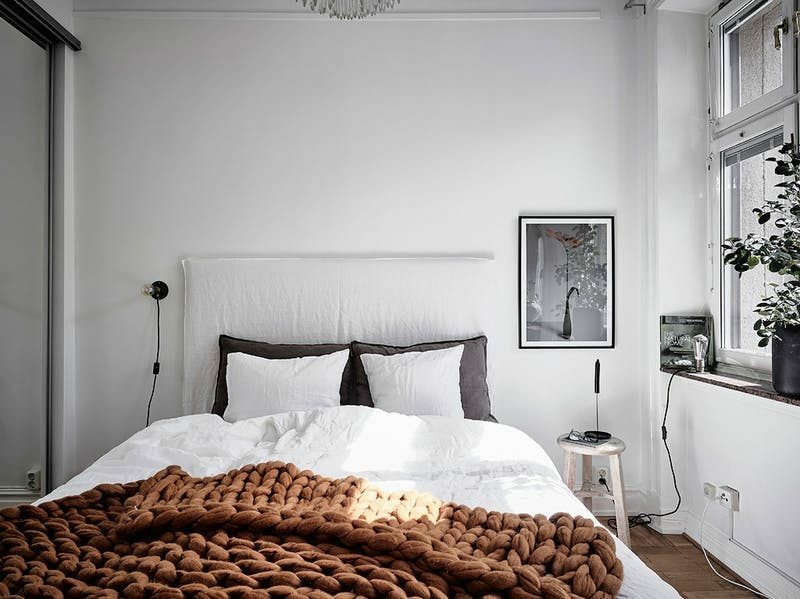 Pairing earthy browns with industrial greys creates an environment that just about everyone likes, so if you and your partner don’t see eye to eye on color choices, consider creating a color scheme similar to the above bedroom. 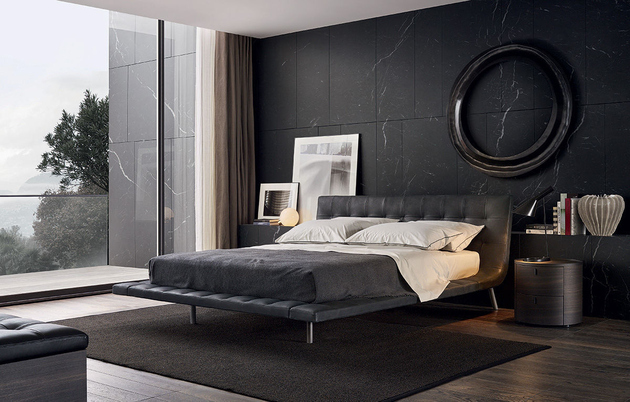 Since the main job of a bedroom is to create a relaxing place to fall asleep in, the choice of black as a dominant color choice just makes sense. 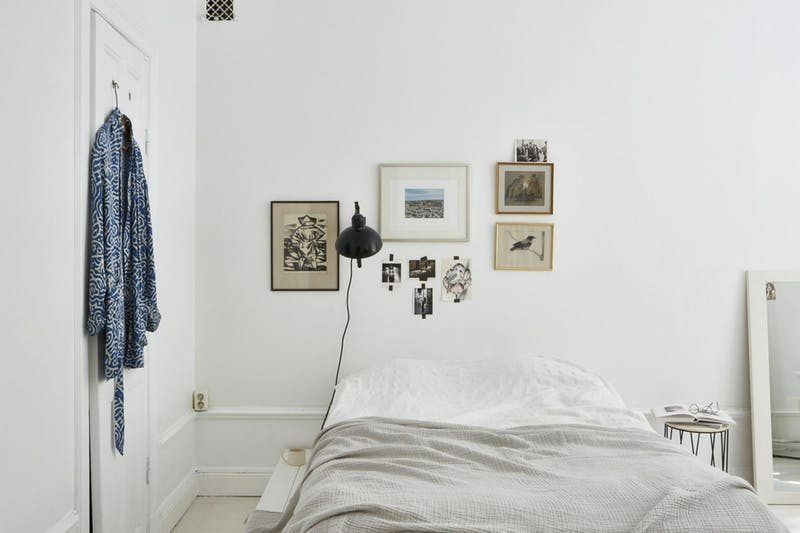 The above design layers in black via the area rug, art above the bed and even on the door. A real trend in modern design is to display frames in bold colors with nothing actually in the frame. The bedroom above shows just how beautiful this concept can be with its black on black frame and wall. 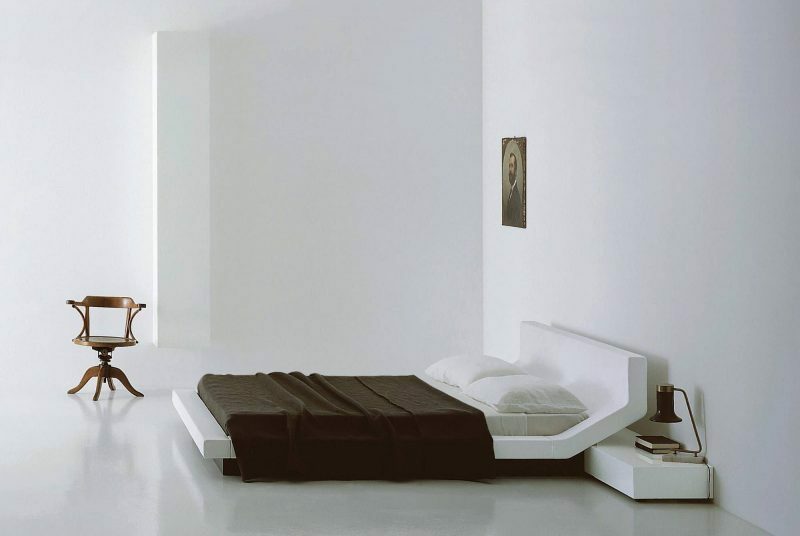 This modern interior is a rhythmic composition of black and white with most of the architectural details in white and almost all of the furniture and accessories in black. When you have a gorgeous view there is no need to bring the outdoors inside, floor to ceiling, wall to wall windows will do the job just fine and when its time for a little privacy, simply draw the curtains or pull down the shades. The beautiful park like setting outside the windows of the bedroom above is the perfect backdrop for a playground effect created by incorporating bold swathes of color and large graphic shapes, all purposely off kilter in a street chic sort of way. Geometric moments can be subtle while still making a big impact as seen in the above photo within the cage light pendants on either side of this modern bed. The bedroom above also draws attention to the light above the bed, only this one is a floor light cantilevered over the bed. What a great way to incorporate lighting when there are no immediate electrical boxes! Nothing says modern like a photo collage displayed in a random pattern and when mounted on a distressed wall the effect is warm, comforting and very creative. Layered into this modern bedroom look is an unexpected bit of glam via the chandelier – like stars in the sky. 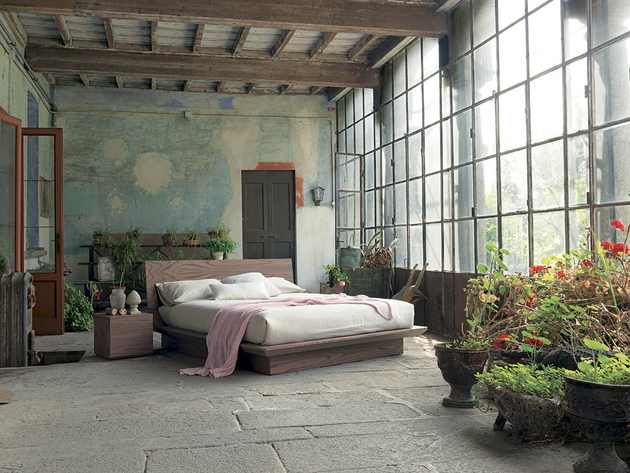 A big trend these days is to bring a bit of the outside indoors and the above bedroom does that with container plants and a distressed sky blue headboard wall. the wall is like an abstracted map of the world. 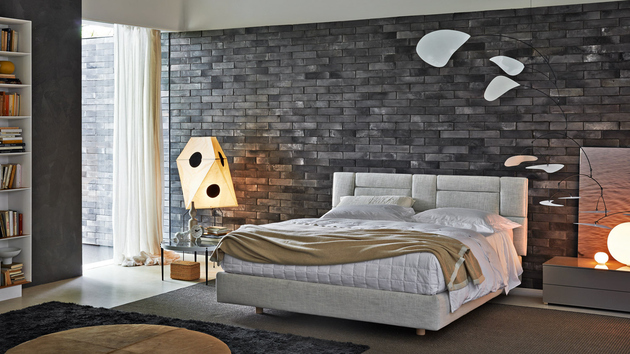 Modern design is all about showcasing a few bold choices rather than a lot of this and that and this bedroom is showcasing its ever so clever headboard/night stand. The headboard even has a strapped in place cushioned section behind the actual cushions and incorporates electrical plug ins for lights and gadgets. Have you ever wished for a more comfortable way to rest your arms when watching TV, reading or just hanging out in bed? Target Point has that covered. 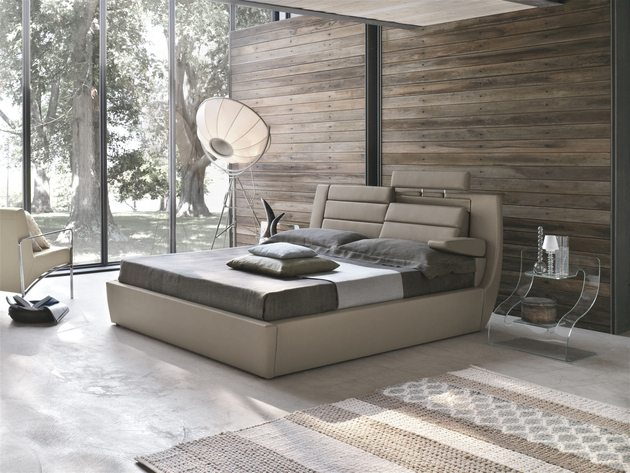 With armrests built into the bed frame, but not just that, this bed also has full Lombard support and an adjustable headrest. In fact it is so ergonomic you might not ever want to get up! 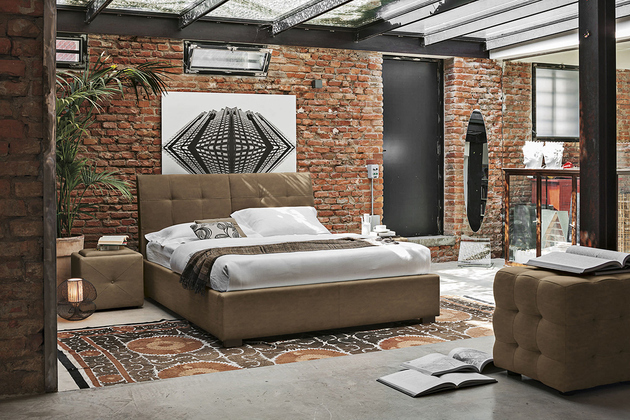 Asymmetry is all the rage these days in modern design, as are platform beds, so when the two design concepts are combined in a low profile bed and combined with a shag rug and a low, wide ottoman, the look is totally fresh and comfortable. An aged natural brick wall is full of stories that have never been told. You know the phrase “nothing goes past these four walls”. Well in a bedroom that might be a very good thing indeed. When using naturally patina’d brick, the colorations are distinct and can’t be ignored in the rest of the room. Here, the area rug has been carefully selected to play off of the brick harmoniously while at the same time injecting a bold pattern into the otherwise pattern free room. While grey bricks don’t have as much of a minimizing effect to the brick as white, the neutral color is a great way to feature white moments such as this kinetic mobile an the faceted dot lamp. White bricks are a classic look that pairs well with a modern interior, the white also minimizes the brick, letting other elements take center stage such as the uber chic lamps. 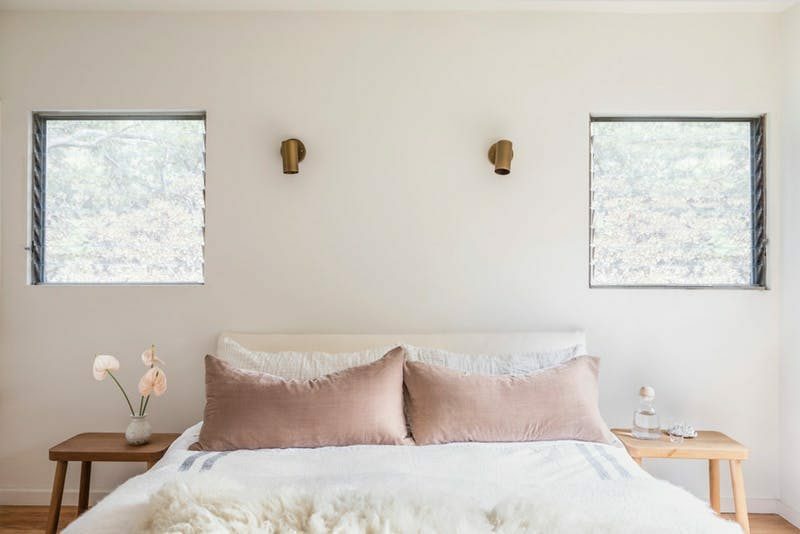 Keep a neutral bedroom palette interesting by incorporating a single muted shade of color into the scene; the blush-hued pillows we spotted on Domino keep things subtle. 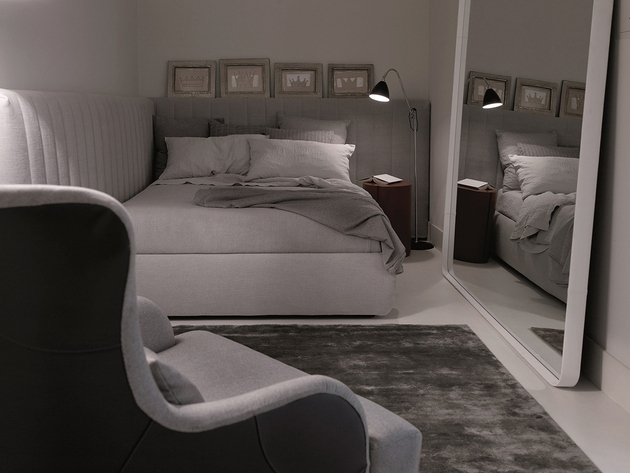 For an unexpected splash of color and texture in a black, white and gray bedroom. Throw an extra chunky textile in a contrasting hue like this super plush sienna stunner we spotted on Entrance Makleri on your bed. Whoever says you can’t have a minimalist inspired gallery wall obviously hasn’t seen this salon-style installation on Fantastic Frank. Stick with small images in neutral frames to keep things clean and uncluttered. The pictures above are very interesting and full of creations. 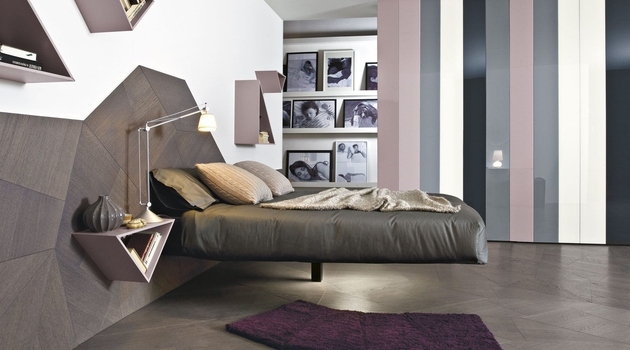 Discover your creative ideas with bedroom design ideas above. Choose what suits your inspiration.